After sharing my curried cabbage soup yesterday, I got an email from a Stonesoup Diaries reader asking the type of curry powder I use. Which got me thinking. I used to avoid recipes that called for generic curry powder because I had this feeling that it took more than a curry powder to make a real curry. Over the last few years, especially with my focus on using fewer ingredients, I’ve realised that a good curry powder is one of the easiest ways to make a curry. The secret is choosing a good quality curry powder made from fresh spices. If you have a spice merchant that you trust, you’re in luck. I love herbies.com.au. But I’ve also really gotten into making my own curry powder. It’s one of those things that is so much more rewarding than the actual effort required. 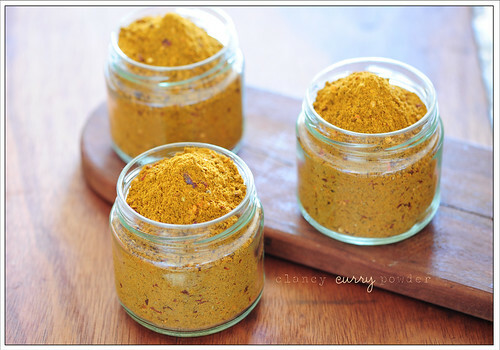 So today I thought I’d share my recipe for my ‘Clancy Family Curry Powder’. Feel free to adopt it as your own ‘secret’ family recipe. Use anywhere a recipe calls for curry powder. Feel free to halve the chilli if you prefer a milder curry. 1. Combine cumin, coriander, chilli, turmeric and pepper in a small bowl or plastic bag. Stir or shake until well mixed. 2. Store in an airtight jar.